What Is the Difference Between Curry & Turmeric? Turmeric, a relative of the ginger plant, has a slightly bitter taste and adds vibrant yellow color to your dishes. Curry powder is made up of a blend of spices, including turmeric, cumin and chili powder, and it can range in flavor from mild to very spicy. Because curry contains turmeric, it shares some of its nutritional benefits; however, curry and turmeric differ slightly in their vitamin and mineral content. 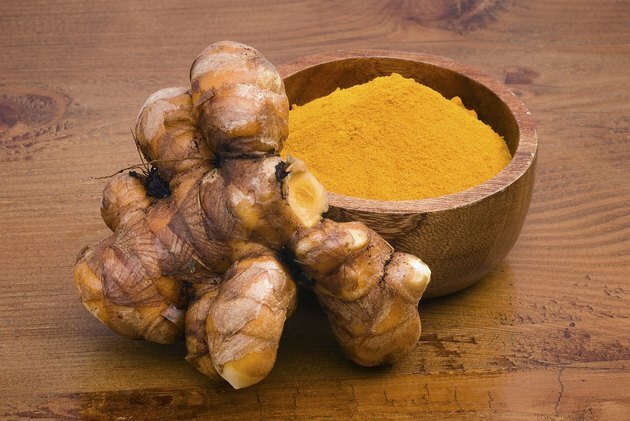 Because curry contains turmeric, they share a similar active ingredient -- curcumin -- and offer several similar health benefits. Curcumin acts as a potent antioxidant. This means that it prevents genetic mutations and cell membrane damage that can occur due to oxidation. Curcumin also offers digestive benefits -- it might combat bloating and gas if you have indigestion and helps prevent relapse in people with ulcerative colitis, according to the University of Maryland Medical Center. The medical center says preliminary studies, performed in test tubes or lab animals, show that curcumin might have cancer-fighting benefits, but more research is needed to know if it really works. One major difference between curry and turmeric is their iron content, with turmeric being a much better iron source. Each tablespoon of ground turmeric contains an impressive 5.2 milligrams of iron, which translates to 65 percent of the daily iron needs for men and 29 percent for women. A tablespoon of curry, on the other hand, contains just 1.2 milligrams. Your body relies on iron for healthy oxygen transport -- iron makes up the active component of red blood cells, allowing these cells to distribute oxygen to your tissues. Getting enough iron in your diet offers other benefits -- it helps your cells generate energy and plays a role in immune function. Curry and turmeric also differ in their manganese content. Turmeric comes packed with manganese -- each tablespoon provides 1.9 milligrams, which fulfills 82 percent of the daily manganese needs for men and more than the entire daily needs for women. Curry offers less manganese per serving, at 0.52 milligram per tablespoon. The manganese in your diet supports healthy wound healing and acts as an antioxidant to nip cell damage in the bud. It's also linked to disease prevention, according to the Linus Pauling Institute -- low manganese levels correlate with a higher risk of diabetes and osteoporosis. Curry powder offers a nutritional advantage over turmeric when it comes to vitamin E. Each tablespoon offers 1.6 milligrams of vitamin E, or 11 percent of an adult's daily vitamin E needs, while a tablespoon of turmeric contains just 0.4 milligram of vitamin E, or 3 percent of the recommended daily intake. Alpha-tocopherol, the most active type of vitamin E and the form of vitamin E found in curry and turmeric, acts as an antioxidant. It also helps your cells communicate with each other, and this role is important for healthy tissue function. In addition, this form of vitamin E regulates the activity of small blood cells, called platelets, that control blood clotting.